Television presenter Dimtry Kiselyov says the new structure’s mission is to restore “a just attitude toward Russia as an important world country with good intentions”. A prominent and outspoken Russian television presenter appointed by the Kremlin to head up a new media conglomerate that will replace RIA Novosti news agency said Monday he would try to improve the world's attitude toward Russia. "Restoration of a just attitude toward Russia as an important world country with good intentions - that's the mission of the new structure I am about to head," Dimtry Kiselyov told state-owned Rossiya-24 TV channel. The Kremlin announced the dissolution of RIA Novosti, the country's leading state-run news agency, in a decree issued Monday that outlined plans to reorganize government media assets. News agency RIA Novosti and the state-owned Voice of Russia radio are to be scrapped and absorbed into Rossiya Segodnya. Kiselyov has come to prominence in recent weeks after a clip of inflammatory remarks he made about homosexuals in a program that aired last year was uploaded to the Internet and became a viral hit. 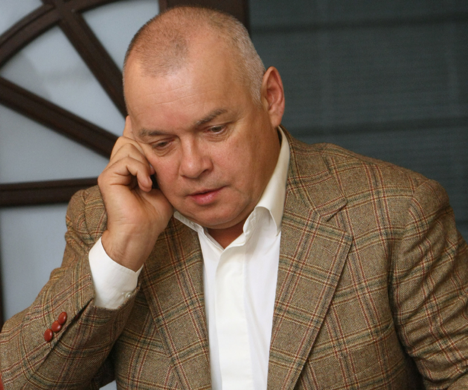 In the clip, Kiselyov is shown saying that he believed homosexuals should be banned from donating blood and sperm. He said in the same program that the heart of any homosexual that died in a car accident should be burned or buried alive rather than be offered up for transplant. The move to dissolve RIA Novosti and Voice of Russia is the latest in a series of shifts in the country's news landscape, which appear to point toward a tightening of state control in the already heavily regulated media sector. Presidential administration head Sergei Ivanov said the changes were about saving money and making state media more effective. "Russia has its own independent politics and strongly defends its national interests: it's difficult to explain this to the world but we can do this, and we must do this," Ivanov said.